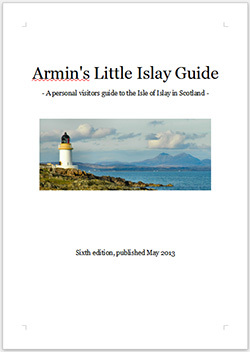 Back in 2007 I started a project some of you will be familiar with, Armin's Little Islay Guide, a printable Islay guide. There have been a few updates over the years, unfortunately the most recent one is now almost exactly two years old. Time to get my act together and get the sixth edition published. I'm already painfully aware of a few things needing updating, among them that Persabus Pottery is back in business. Considering that I recommend it regularly I should also give The Bowmore House a mention. A more recent addition I need to add is the Fly Cuppa Cafe. And much more. But while I know a lot I don't know everything. Or spot everything. So is there something you think I should write about, something you think I should mention? Or an error you spotted? While I can't promise everything will find its way into the guide I will certainly look at any suggestions you might have. You can either send it to me by email or just leave it in the comments below. Thank you!